From opening the door to the beautifully modern designed studio apartment, you receive the warm welcoming feeling of the city has to offer. The open space of the apartment is perfect for the corporate times through to the exclusiveness of a couple wanting to be part of the city as well as enjoy the amazing view of Table Mountain through the wide windows. The bathroom is on your immediate right from entering the apartment which is perfect after a long trip to the Mother City. The bathroom is a perfect size if you want to share it, rather than being alone with a comfortable sized shower. Having the kitchen part of the entire space, you don’t need to be alone when you are preparing a meal. The kitchen is modern designed to become one with the rest of the space which still allows the chef to come out and play. It is fully quipped from the nights you prefer staying in and cooking with a show playing in the background to heating up the previous night’s take out. Having the curtains open you can enjoy your breakfast at the dining table with Table Mountain in the background or have a glass of wine keeping yourself entertained with the bustle that the night life tends to offer. You can choose from either enjoying a good movie only from the comfort of your bed to falling asleep with the night lights the city tends to offer. You can also choose to enjoy watching a game from one of the single comfortable chairs in the apartment, especially if you get excited about the game that is on and you can’t stay seated for longer than a second. 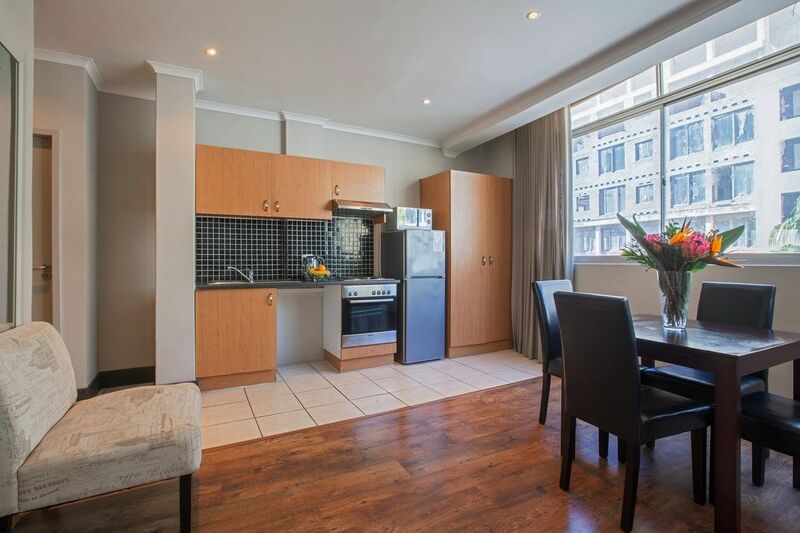 A modern spacious designed self-catering studio apartment on Old Town Square, centrally located in the CBD. Complex features a pool and gym area. Situated on the corner of the building with large windows and great views especially towards Table Mountain and a part of the city.